This is one crowd-pleaser! It’s classy, easy, healthy. Our delicious shooter is also versatile and totally Instagram-worthy! 1 piece frozen NZ cooked green mussel on shell, removing any visible beard. Thaw under running water and ready to use. Rinse mussel and pat dry with kitchen towel. 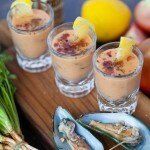 Place mussel in chilled shooter glass. 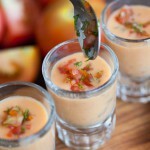 Fill the shooter glass with chilled Tangy Tomato with Basil soup. Drizzle with the Tabasco sauce, and freshly cracked black pepper and sea salt. Serve with a lemon wedge. Enjoy!